An extremely well constructed medium to full bodied cigar, Hoyo de Monterrey Excalibur is a superb example of Honduran craftsmanship. Lighter in color than a Cuban cigar as a result of its fine Connecticut Shade wrapper, this cedar-aged cigar is made with a rich Honduran blend that is very much in the Cuban tradition.The cigar that was inspired by the legendary sword of King Arthur, Excalibur strikes a perfect balance between the straightforward taste of its rich filler tobaccos and the smooth-smoking flavor of its Connecticut Shade wrapper. 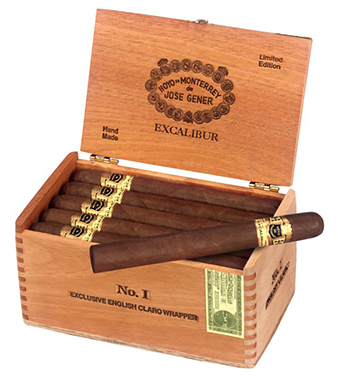 After the Excalibur cigars are rolled by master cigar makers, they are carefully packed in handsome boîte-nature boxes of Spanish cedar to enhance their bouquet and character.